The 35th Infantry Regiment Association salutes our fallen brother, SSG William Roger Holbrook, who died in the service of his country on March 15th, 1966 in Darlac Province, Vietnam. The cause of death was listed as Small Arms/AW. At the time of his death William was 23 years of age. He was from Columbus, Ohio. William is honored on the Vietnam Veterans Memorial at Panel 06E, Line 10. The decorations earned by SSG William Roger Holbrook include: the Combat Infantryman Badge, the Parachute Badge, the Purple Heart, the Air Medal, the National Defense Service Medal, the Vietnam Service Medal, the Vietnam Campaign Medal and the Vietnam Cross of Gallantry with Palm Unit Citation. The following was taken from a Columbus, OH newspaper archive by Bob Stedman. Staff Sgt. William Roger Holbrook had a feeling last Christmas he might not return home alive from his second visit to Viet Nam. At 10 A.M. Saturday, full military services will be conducted for the sergeant in the Jerry Spears funeral home, 2693 W. Broad St., with burial in Green Lawn Cemetery. "He was always cheerful in his letters home, but we talked straight to each other and he was worried," said Benny Harmon, a friend of Holbrook's from Hawaii. 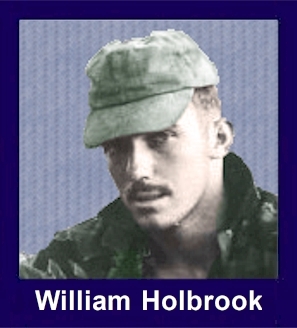 Holbrook, of 145 S. Warren Ave, was killed March 15 by a mortar fragment. He was due to rotate to the mainland by the end of this month. A member of the 25th Infantry Division, Holbrook was wounded during his first five month tour in Vietnam, where he had gone as a volunteer to ride shotgun in helicopters, to protect them from ground fire. After recovering in Tripler Army Hospital in Honolulu, he returned to Viet Nam with his unit on Dec. 27. Holbrook enlisted in the army for a career after graduation from Central High School in 1960. He was awarded the Viet Nam Expeditionary Medal, Purple Heart, and Air Medal with three Oak Clusters. Survivors include his wife Rosa Linda, of Hawaii, parents Mr. And Mrs. Charles Holbrook of Warren Ave., Sisters, Mrs Sharon Lynn Wing, Mrs. Barbara Hessler, and Mrs. Kaye Wing, and a brother, James. Friends may call at the funeral home between 2 and 4 and 7 and 9 P.M. Friday.